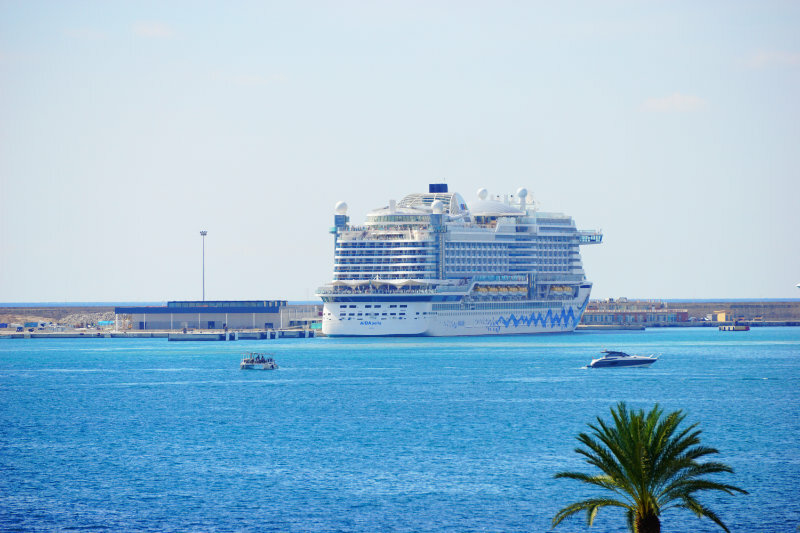 Our cruise with the AIDAperla began and ended at the port of Palma on Majorca. 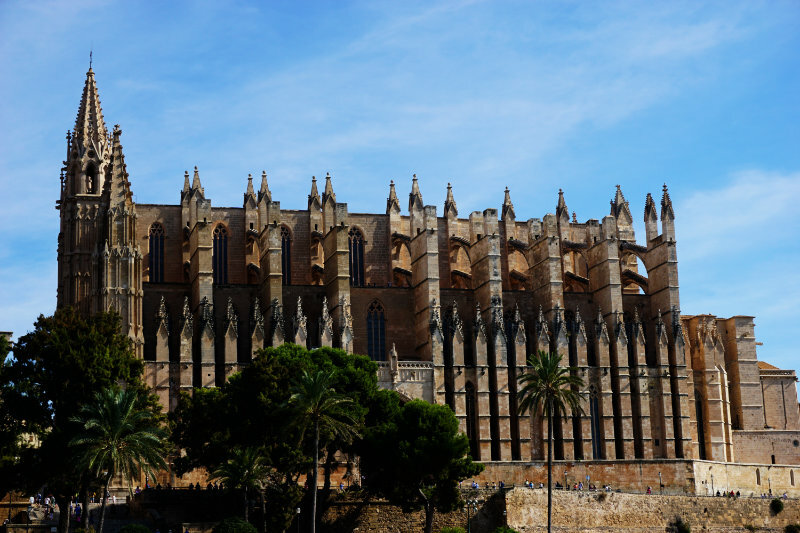 We took the time on our departure day to get the shuttle into the city to visit the Cathedral of Palma. The shuttle is a direct connection from the AIDA to the city. It takes about 15 minutes and stops right beneath the cathedral. A return ticket costs 8€ and the times for the shuttle are given to passengers on the ship. For those who would like to save some money, public transport is an option. It is a 15-minute walk to the next bus stop from where line 1 takes passengers close to the cathedral. A single ticket costs 1,50€ and the trip is a bit longer since it isn’t the most direct route. La Seu is Catalan and translates to “The Bishop’s See”. 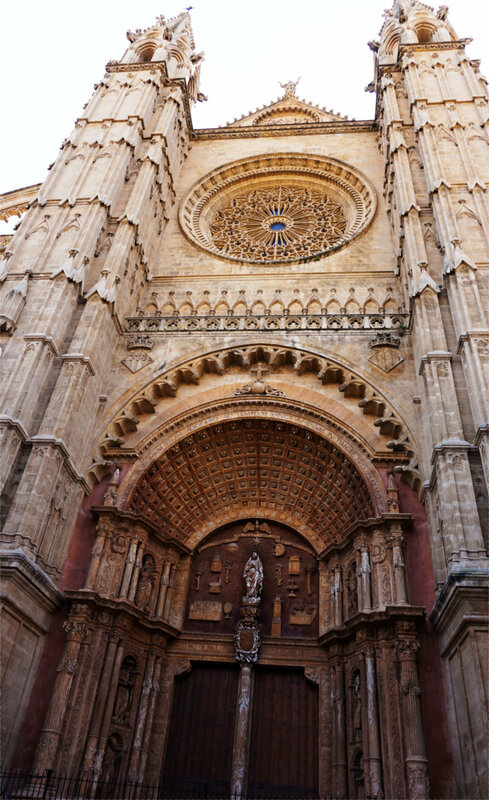 The Cathedral of Holy Mary in Palma is the Bishop’s See of the Bishopric of Majorca and was therefore given the name La Seu by the locals. 1230, after the liberation from the Moors, the foundation stone of the church was laid. King Jaume I. choose a spot occupied by an Islamic mosque. The nave was finished in 1587 and the façade was completed at the beginning of the 20th century. The building imposingly rises from the ground near the coast. Even though it has no proper church towers, the nave, being 44 metres tall, can easily be seen from afar. A few steps from the promenade lead up to the building. The entrance is at the far side from the water. This is where one can get the tickets that are also valid for the corresponding museum. 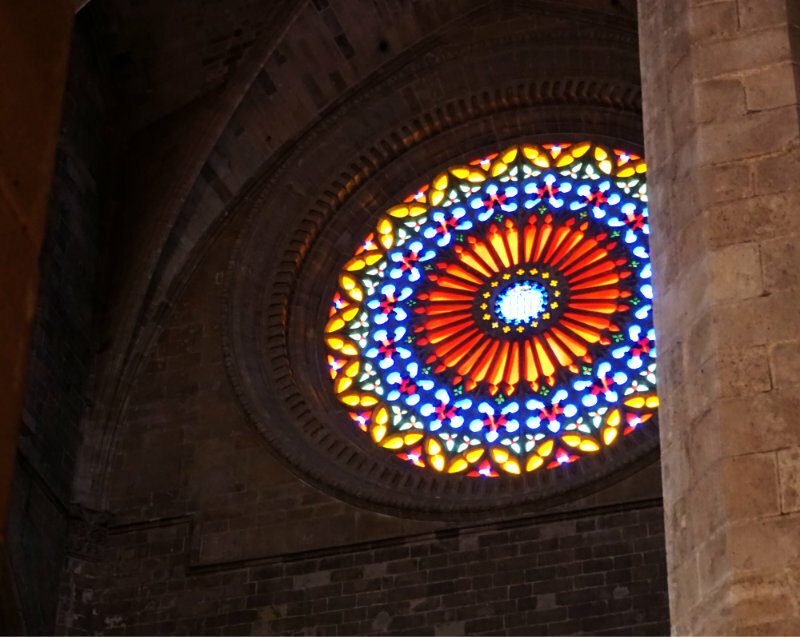 The round stained-glass window above the aspis is an eye-catcher. 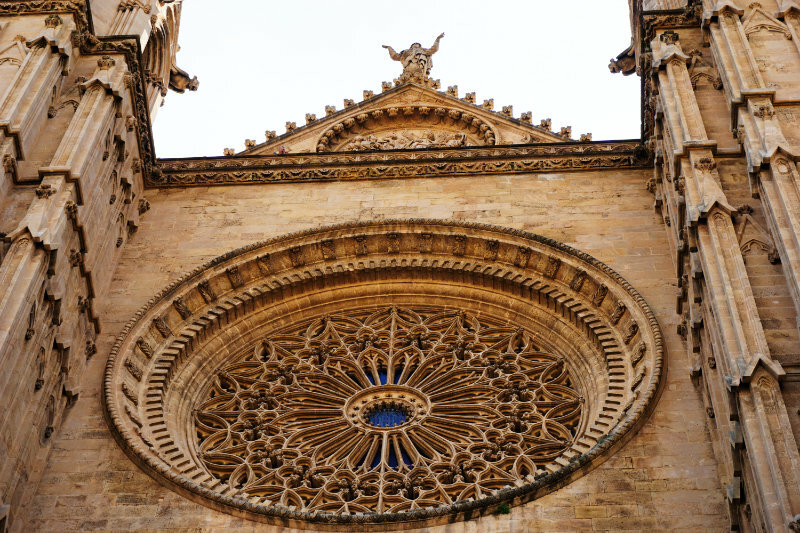 Its diameter is approximately 12.55 metres which makes it the world’s biggest gothic rosette. Another 5 rosettes and 60 wonderful stained-glass windows give the church a characteristic style. Many master builders contributed to the design of the church over the years. Even Gaudí perpetuated his name as part of renovation and redecoration works (1904 – 1914). 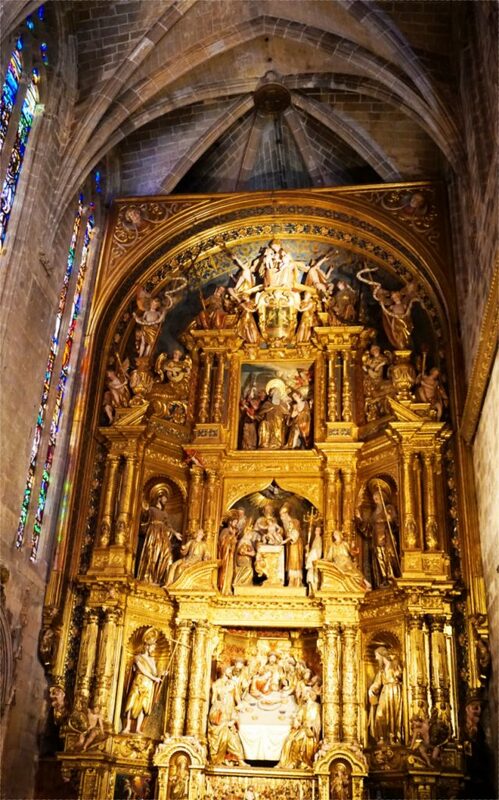 He transferred the choir room from the middle of the nave into the king’s chapel and gave the believers full and unrestricted view of the high altar. He had a cavity installed underneath the organ as a sound chamber. No microphones are needed to amplify singing. We enter the Cathedral of Palma and are welcomed by music and singing. A choir and an orchestra were practising for an event in the evening. This made our visit very atmospheric, the acoustic is absolutely impressive. The music was lovely and the benches were filled with visitors of the church who were all soaking up the wonderful atmosphere. This is how a visit to a church gets fun. My gaze was magically drawn to the beautiful windows. The light entered the nave through the stained-glass windows and colourful shadows danced across the mighty columns. We slowly walked through the church until we came to an area that didn’t seem to match the rest of the building. 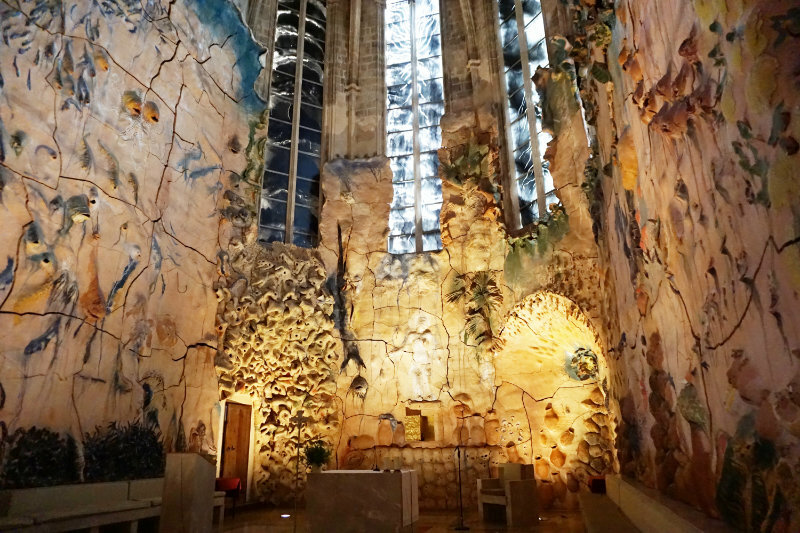 In 2007 the Majorcan artist Miquel Barceló redesigned the Chapel of the Sacred. The huge ceramic pieces in contemporary designs do not really match a 700-year-old church. A passage from the Bible is depicted in the designs, telling the story of the miraculous multiplication of bread and fish. I did not like it. 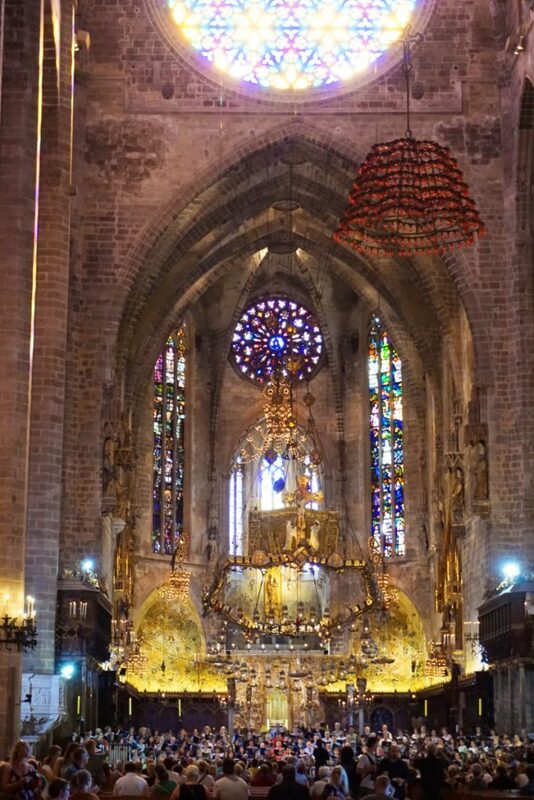 But otherwise, I recommend a visit to the Cathedral of Palma. A lovely church with many interesting details.